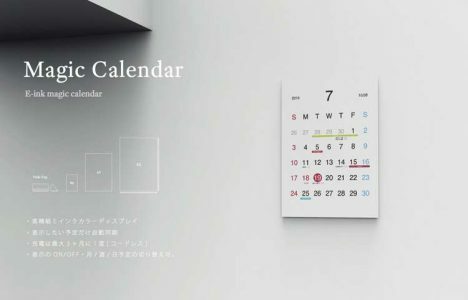 Bridging the gap between classic calendars and high-tech displays, this paper-like system lets you see your days, weeks and months in a conventional fashion while being tied into a high-tech system. 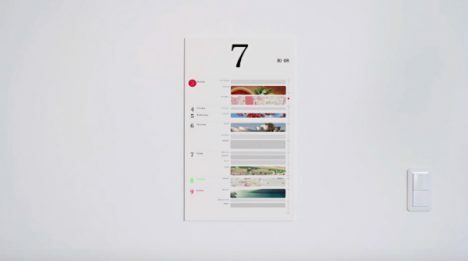 Japanese traditions of painting, calligraphy and demure decor have given rise to the Magic Calendar from Japanese Android Experiments, something that lets a new-fangled interface look classic and familiar for users. It appears like a paper calendar on your wall, but in reality it syncs with your Google Calendar account, updating itself as your appointments and meetings change over time. Thanks to e-paper, it can be synced but look static at any given time, giving you the dynamic information of a smartphone schedule in a comfortable and traditional format. The use of e-ink also reduces the energy requirements of the calendar. Of course, formats can also be edited thanks to the device’s flexibility. “Why, though, go to the trouble of having this wall calendar? If the focus is on keeping track of dates and events, then your smartphone or laptop carries the information you need. The question, actually, can be turned around to why not. “I think that as technology development progresses and these types of products are developed, the boundary between analog and digital things will disappear,” says its inventor. “Interestingly, many comments from those hearing about the calendar have been overwhelmingly positive: Shut up and take my money just about summed up the positive reactions.” It is, pardon the wordplay, a pretty magic cal. See more in Home & Personal or under Gadgets. April, 2017.